The second Clandestine Cake Club Cookbook was published last Thursday and is already proving very popular both with members and non-members. I have been a member of the Clandestine Cake Club for nearly three years now and I can honestly say it has changed my life. I have made some wonderful friends over cake and regularly meet up with a few of them for afternoon tea or lunch and a girly gossip at the same time. The recipe I baked for our Sunday lunch dessert yesterday was created as a homage to the seventh Duchess of Bedford who is believed to have created the idea of the English Afternoon Tea. She needed something to keep her hunger at bay until she ate dinner but then as time progressed friends began to share tea with her. 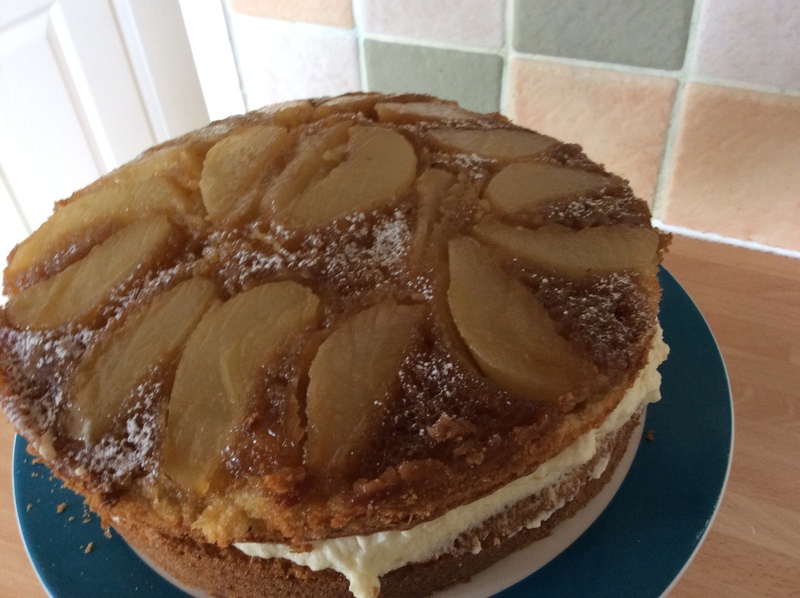 The recipe in the book is called Pear and Ginger Upside Down cake and was created by member Jean Lacey who is from the Loire Valley Clandestine Cake Club. I can just picture this delectable cake being served at an afternoon tea. Pears and ginger are a winning combination to me, although my two children weren’t impressed. Neither my daughter or son like pears though I was convinced they’d eat them in a cake. They said the same about ginger but I’ve seen them eating gingerbread men! So yesterday was going to be a very busy one. 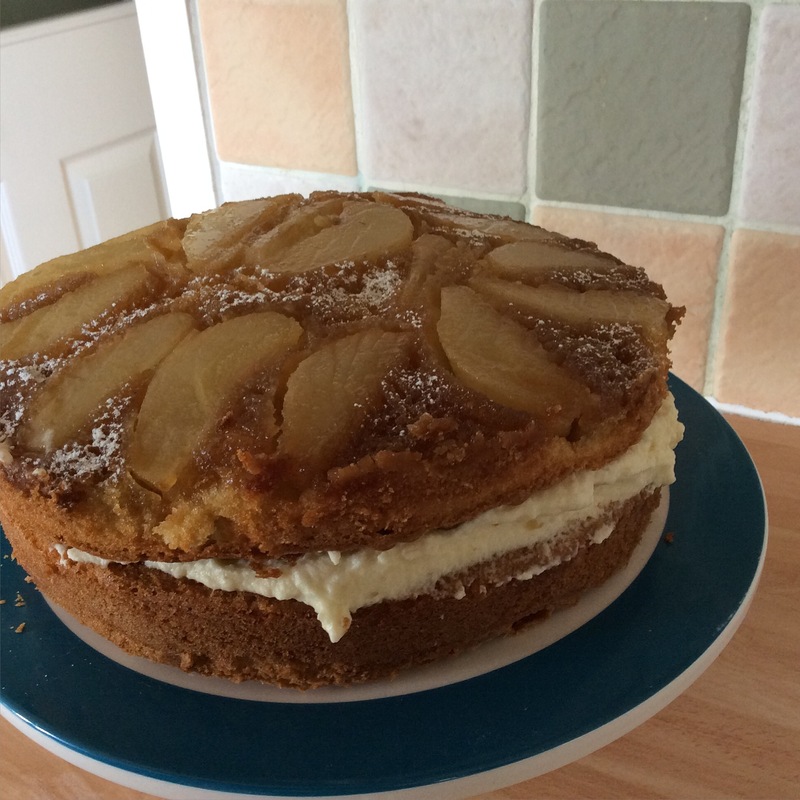 Loads of jobs to do on top of trying to cook a roast beef dinner and to try out the pear and ginger cake recipe. But the ironing could wait! I got out my well used 8″ sandwich tins, greased and lined them and put on the oven. While it was heating up I made the cake batter and prepared the pears. In one bowl I sifted together self raising flour, baking powder and some ground ginger. To this I then added softened unsalted butter, eggs and some caster sugar. All the ingredients were mixed together and then I got the pears ready. On the base of one of the greased tins I sprinkled some light brown soft sugar and then topped them with sliced pears. The recipe said to peel two pears, halve and core them, then cut each half into three wedges. My pears were quite small so I used three but still cut each of the halves into three pieces. There was just enough fruit to cover the bottom of the tin. After that I divided the cake mixture equally between the two tins but had to take care to make sure the pears stayed intact on the bottom of the tin. Once this had been done, into the oven they went and were baked for about 20-25 minutes. The Pear and Ginger Upside Down Cake was baked in two separate 8″ sandwich tins. 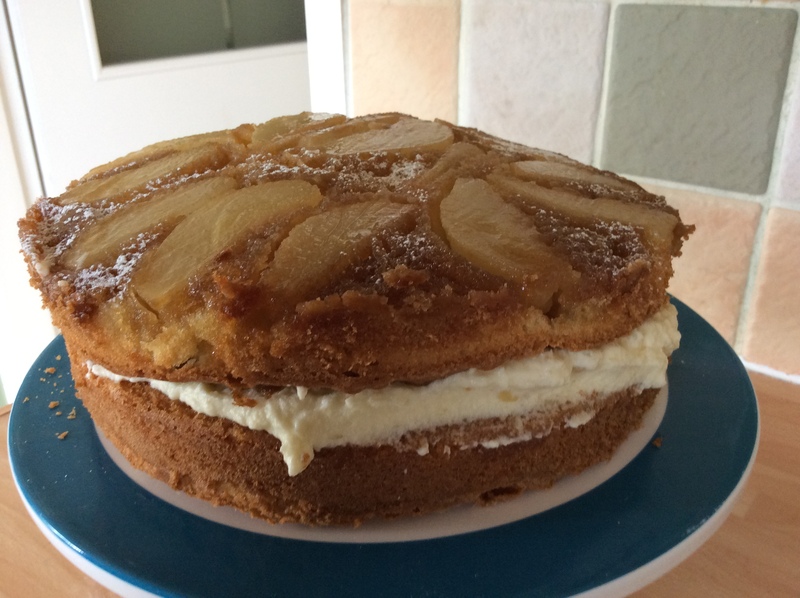 There was a layer of brown sugar topped with sliced pears in the bottom of one of the cakes. The cakes cooked beautifully in the oven and rose well. I put them on a wire rack to cool down and left them for a while when I went out for a dog walk. When I came back I turned the cakes out onto the wire rack. I had to use my Nordicware Cake Lifter to help me move the pear layer as it seemed more fragile. To finish the cake there was a delectable filling to make up. It consisted of a layer of ginger preserve or jam with some sweetened whipped cream on top. I found some delicious Tiptree Ginger Jam from Ocado the other day. I was meant to spread a layer of the jam on top of one of the cake layers, then add the whipped cream. Only I didn’t read the recipe properly and I added the jam into the whipped cream mixture. It still looked okay though. The cake was layered with a divine tasting ginger infused whipped cream filling. To finish I dusted the cake with some icing sugar and put it on my cake stand ready for dinner. I was very impressed by the flavour of this cake. It was very enjoyable to make and I felt it was one I could bake over and over again. In the end I scoffed a piece at 4 pm. We weren’t eating our roast dinner til about 6.30pm when my daughter had got in from work and I was ravenous. It’s fatal having cake in the house when you are hungry, especially one that you know you’ll enjoy the flavours of. My husband had a small slice after his roast but my kids turned their nose up at it: “What have you put fruit in it for?” So the rest got cut up and is now in a plastic box in the fridge. 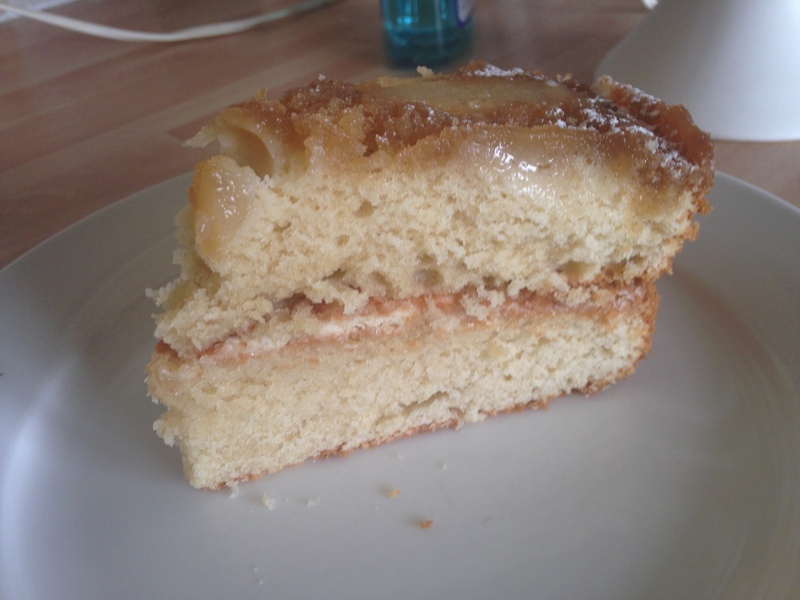 I’m trying to forget about the rest of the cake but then I’ve started back at Weightwatchers…. Next Post Welsh Honey and Camomile Bara Brith- My Own Recipe Featured in The Clandestine Cake Club A Year Of Cake.